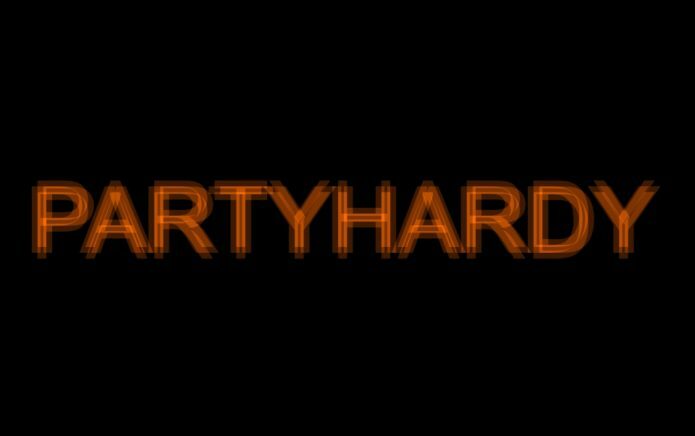 * Partyhardy è una festa diurna. 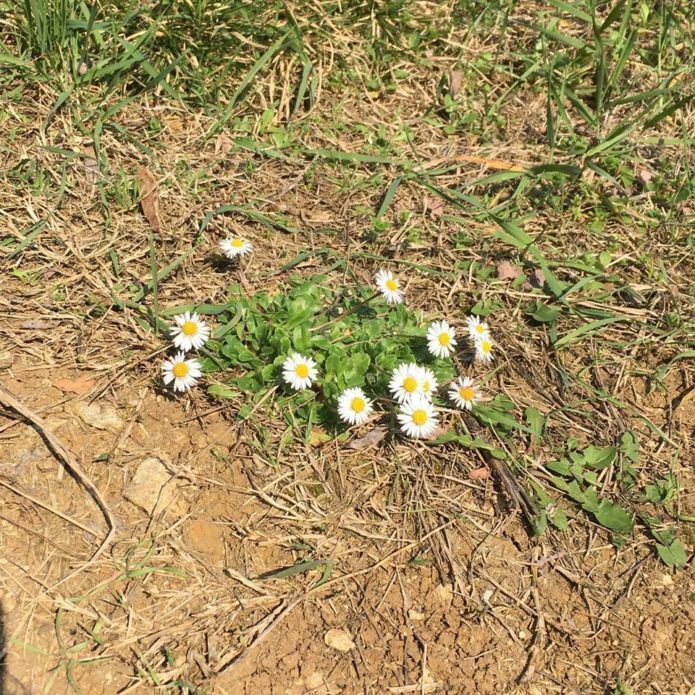 Arriva presto e goditi una giornata all’ombra delle piante, portati un telo per stenderti e rispetta la natura che ti circonda. “In the wood”, come quel party che in passato è stato protagonista della scena Vicentina per tanti anni.. Free Spirit era il motto, ovvero danza, libertà e spensieratezza! 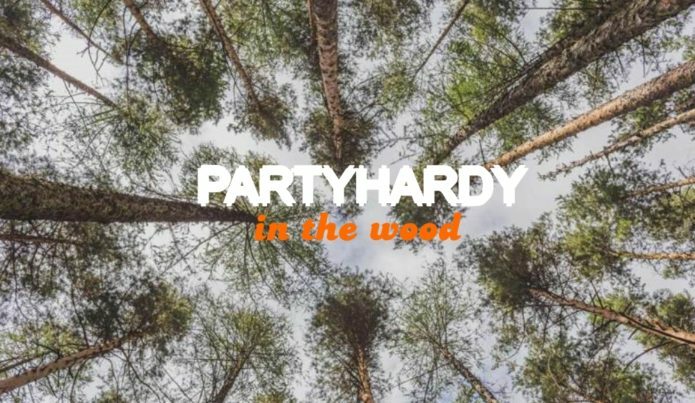 Party(hardy) in the wood 2017: totalmente immersi nel verde in una location mozzafiato. Rispetta la location, la natura e tutto quello che ti circonda. NB: In caso di maltempo il party si svolgerà a data da destinarsi. My Name is Chris. I am from the south side of Chicago. 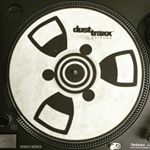 I have been DJing and collecting Chicago House records since I was 15 years old (about 23 years). I started @House_Nation_Chicago to share my record collection and educate new people about Chicago House, Italo, and Deep House Music. I hope to use these records to tell the stories of the evolution of Chicago House Music. I have another instagram page @kanamit_mpc where I service and sell drum machines. I follow a lot of producers and sample cats. I would always see guys post their records and it was always soul or jazz. 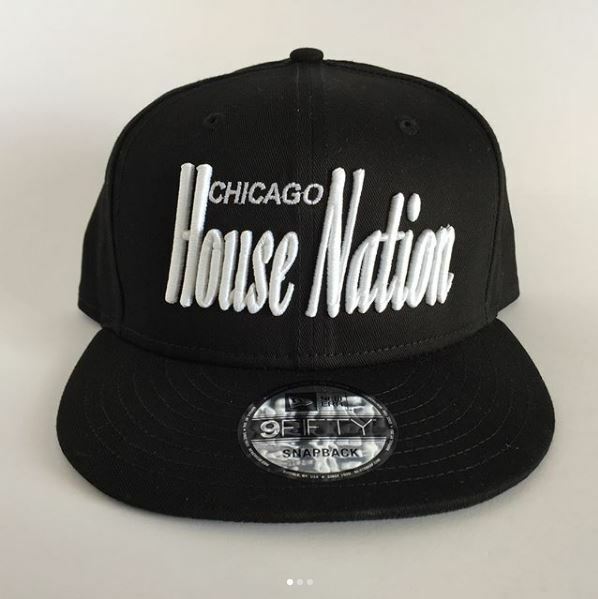 I didn’t see any page dedicated to House music, so I decided to make @house_Nation_chicago. As a DJ, I get my inspiration from old WBMX mixes by Farley Jackmaster Funk. If I’m trying to produce something I study the greats like Marshall Jefferson, Mr Fingers, Farley, DJ Pierre, etc. Chicago House Music was able to grow because of the clubs like the Warehouse, The Playground and The Music Box. Those were special places where Frankie, Ron, Jesse and Farley could be play the music they wanted. They could experiment and try different styles of music. Once the city of Chicago changed the laws on juice bars they could no longer operate and that almost killed the scene here. There are always house parties going on in the city. Of course there are certain clubs that always play house, but I don’t think anyone can duplicate the feeling or sound of the Music Box. A few times a year there will be a big Hot Mix 5 party or Farley’s B Day bash. The biggest event of the year is the Chosen Few Picnic. It takes place in a park by the lake. Theres no dress code and no age limit. I think that is really where people can go and just be free with the music. There’s young and old, black and white. People just go there for the music and to have fun. 4. 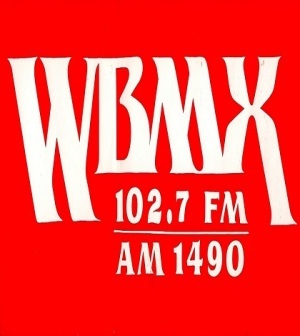 I heard from Mike Huckaby (Deep Transportation – Detroit) that several Detroit djs moved to Chicago with their car almost every week to listen to Chicago’s legendary WBMX AM & FM. Talk about this radio and the incredible music shared on their radio shows. In my opinion WBMX is the big part of the puzzle that really gets overlooked. You see, Chicago was a very segregated city. You have black neighborhoods, white neighborhoods, Mexican, Puerto Rican, etc. People stayed in their own neighborhoods. Back in the 80s The Warehouse was a gay black bar. Most people were not going to party there. Wbmx is very important because it allowed the music to reach everyone in the city. WBMX Program director Lee Michaels had a city wide dj competition. Everyone submitted tapes, even Frankie Knuckles. Lee selected 6 DJs with different styles to represent the different parts of the city. The DJs he picked became known as the HOT Mix 5. (The 6th guy never showed so they ended up with 5) Instead of going to a club you could hear this music on Friday or Saturday night from you car or bedroom. This is what really helped get the music to everyone around the city. The type of music they played, how they played it, and the skill that they had was never ever seen or heard before. 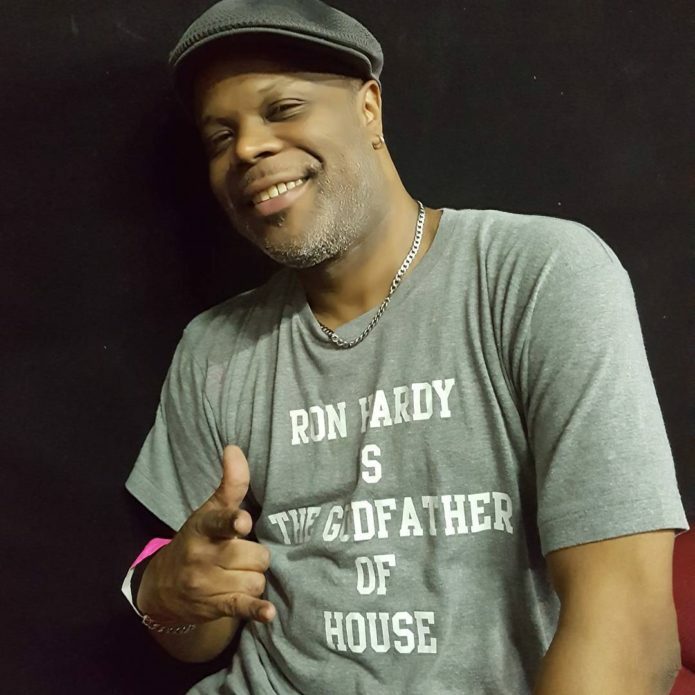 Everyone loves Frankie and there wouldn’t be a movement without him and the Warehouse, but it was Ron Hardy who made Chicago house as we know it today. Anything that Marshall Jefferson made he took to Ron. Ron was playing these tracks and no one ever heard of Virgo or Marshall Jefferson. Dj Pierre gave Acid Tracks to Ron. Ron played it 4 times. The first 3 times no one danced. The fourth time the crowd went crazy. He was a pioneer. I don’t think house would have evolved the way it did without him. Chicago didnt have any club scene in the 70s. Chicago was dead compared to New York. It wasn’t until Robert Williams opened the Warehouse and invited Frankie to be the resident. This was where it all started for Chicago. Frankie was playing underground disco. People started to talk about it and went to experience the music. They didn’t care that it was a gay club. The music became so popular guys would go into Imports Etc and ask for that house music. Referring to music that was played at the warehouse. 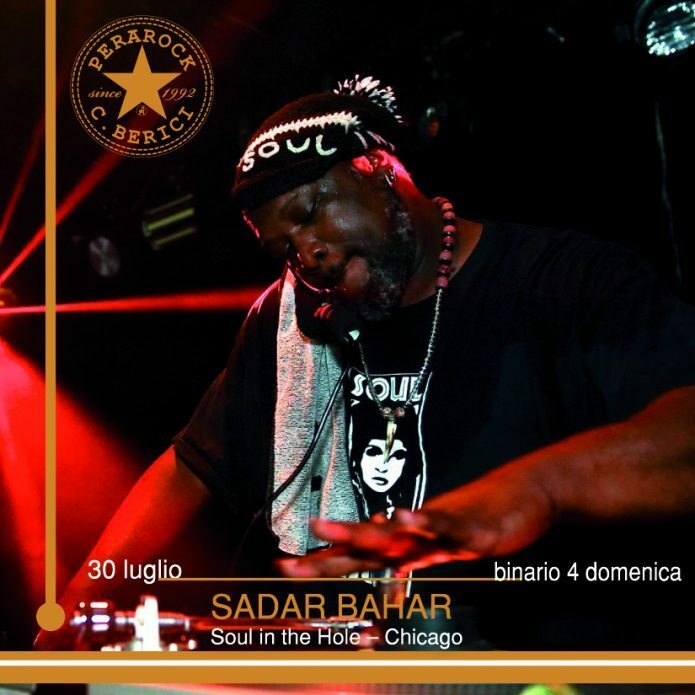 Sadar Bahar has stayed true to the original meaning of house. That is the underground disco that was played at the warehouse. He is known for possessing some of the rarest records from that time. He created his own identity by doing the opposite of everyone else. DJs would all play the same popular cuts and he did the opposite and started digging for rare obscure tracks. He definitely is in a class of his own. I think Italo Disco had a major influence on the Chicago House sound. The Hot Mix 5 was playing alot of Italo Disco and imports. Jesse Saunders and Farley played imports at the Playground. You can really hear the similarities in the drum patters in songs like Chi Chi Liah – Proud Mary or Alessandro Novaga – Electronic Drums. That music heavily influenced early house production. Those records started to show up around 81 – 83. They were not available in every store. There were only 2 places in Chicago where you can get imports. One was the legendary Imports Etc and Loop records. A good example is Hypnotic Tango. I think they sold 30,000 copies of that record here. They kept the pressing plant open just to supply the stores in Chicago. I’m always working and learning. As I said I buy and sell drum machines. Mainly the mpc. I currently work on the MPC 3000, Roland Tr8, Roland TB03, and a Korg Minilogue. I have experiences with all of the MPCs but like using the 3000. I don’t use any software for creating. I think all of the advances in technology have killed creativity. Its not always true, but simple is better to me. 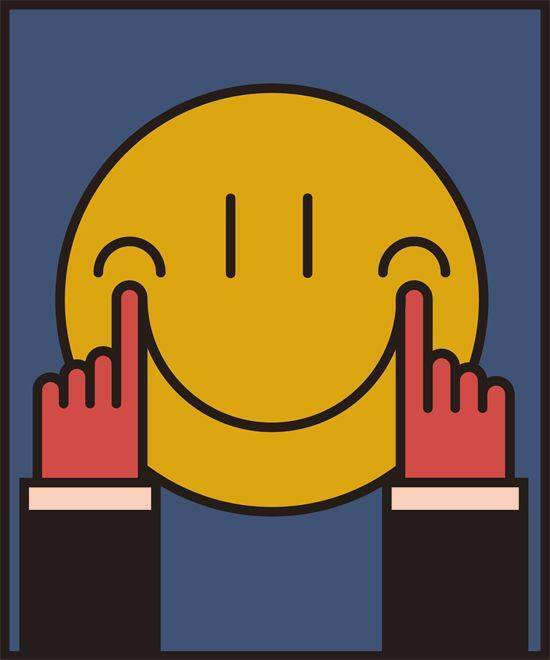 Listen to the music that was made with a 909 and a jupiter (Mr Fingers Can You Feel It). Everyone is doing too much now. Faster workflow yes but not necessarily better music. I have not made any documentaries yet. I have been very fortunate that I have made some relationships with guys like DJ Pierre and Jesse Saunders. If i get the opportunity I would like to do a documentary focusing on how the music was made or how the relationships were formed. These guys were kids and were taken advantage of. theres a lot people don’t know about. Im interested in the gear that was used and the ideas behind some of the songs. Many of those stories never get told because everyone documents the same thing over and over. My dream project is to release a Jack Trax EP on Afro Acid which is DJ Pierre’s Label. Releasing an EP has always been a goal of mine but to do it with the Legendary DJ Pierre on his label would really be something special to me. CHRIS “THE INCREDIBLE” HOUSE NATION CHICAGO intw. 06.2017 Family House. “Mentre tutti i dj andavano da una parte, io ho scelto una direzione diversa”. E questa strada lo ha portato a creare uno stile tutto suo, ribattezzato “Soul in the Hole”. Influenze: soul, funk, boogie, disco arricchite dal suo gusto e ricerca; lunghe ore passate nei negozi di dischi, mercatini per scovare suoni dimenticati, “nuovi”. Una caccia ossessiva, che lo ha portato a essere un vorace collezionista di vinili. Sadar Bahar te lo dice ridendo, perché in lui il buonumore è continuo e contagioso, ma in realtà sta affermando una cosa maledettamente vera. Il suo arsenale di vinili è praticamente sterminato. Chicagoano, cresciuto inevitabilmente col mito di Ron Hardy, ad un certo punto si è reso conto che i dj della sua città tendevano a comprare tutti gli stessi dischi negli stessi posti. Lì è partita quella che lui chiama “…una malattia lunga ormai più di trent’anni”: cercare di tutto, essere un cacciatore maniacale di vinili. La differenza? Li suona divinamente (Damir Ivic). 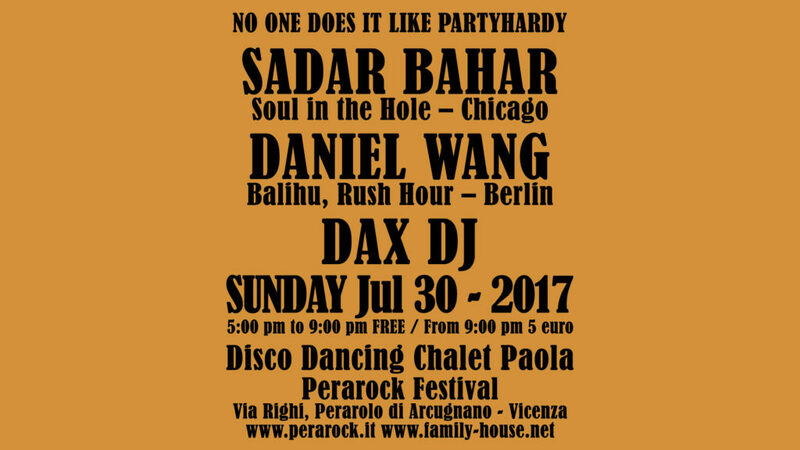 Bahar è stato definito da Theo Parrish “il DJ dei DJ”. Musica calda, seducente, piena di melodie cosmic e vodoo funk, Vi aspettiamo al Perarock! “In the wood”, come quel party che in passato è stato protagonista della scena Vicentina per tanti anni.. Free Spirit era il motto, ovvero danza, libertà e spensieratezza! Party(hardy) in the wood 2017: totalmente immersi nel verde, dalle 11 di mattina, per 12 ore, in una location mozzafiato. Rispetta la location, la natura e tutto quello che ti circonda.